Junk food fundraising is so common place nowadays that virtually no one blinks an eye when they see it. Worse still, in many cases the dollars received in lieu of healthwashing are minimal. 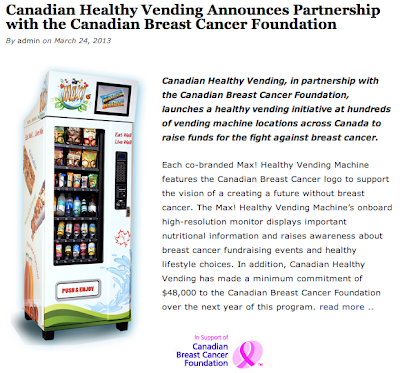 Take for instance the new partnership between the Canadian Breast Cancer Foundation (CBCF) and the so-called Canadian Healthy Vending company. In return for the use of the CBCF logo on their Max! 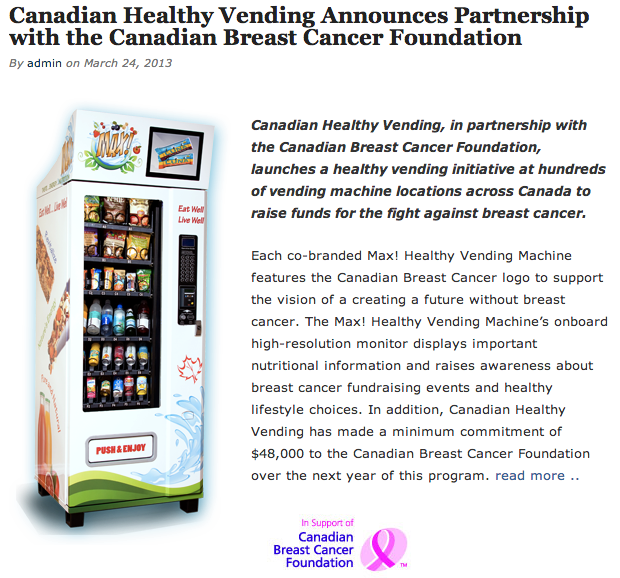 Healthy Vending Machines the CBCF will receive $48,000. "The Foundation is particularly excited about this program as it allows us to extend our message about the importance of healthy lifestyles and reducing breast cancer risk. It’s never too early or too late to take steps to help reduce risk by making healthy choices and learning more about breast health." So what healthy choices are sold in the pink and healthwashed Max! Healthy Vending Machines? Pretty much the same crap that's in any vending machine only this machine calls its contents healthy. There's sugared soda like Natural Brew Cream Soda (9.5 teaspoons of sugar) and Blue Sky Organic Soda New Century Cola (sweetened with 10 teaspoons organic cane sugar). There are cookies like Enjoy Life's Chocolate Chip and Snickerdoodles (each with the same calories and sugar of Oreos) and chocolate bars like Green & Black's Milk Chocolate (nutritionally nearly identical to the iconic Hershey's Milk Chocolate bar). And of course there are potato chips like Old Dutch Baked Ketchup Chips (which according to the nutritional information on the Old Dutch website chip per chip actually contain more calories and more sodium than their non-baked Old Dutch Ketchup Chip brothers). These are not what I would describe as healthy snacks. In fact I've argued before that these sorts of snacks are worse than their non-healthwashed counterparts given the likelihood of their overconsumption or more frequent purchase consequent to their healthwashing. No doubt too, regularly consuming these sorts of products might in fact lead a person to gain weight. As far as weight and breast cancer goes, the links, though correlative, still give cause for concern. According to the National Cancer Institute, obesity increases the relative risk of developing post menopausal breast cancer by 50%. They also report that maintaining a body mass index of 25 could prevent 11,000 to 18,000 deaths per year from breast cancer in U.S. women over age 50, that breast cancer is more likely to be detected at a later stage in women with obesity, and that weight gain during adulthood has been found to be the most consistent and strongest predictor of breast cancer risk in studies in which it has been examined. UPDATE: Crazy that it ever happened in the first place, but the good news is that the CBCF's contract with Canadian Healthy Vending has recently expired and they've no plans to renew!